The star of CBS' No. 1 hit comedy teased details from the upcoming season and dished on her latest project. 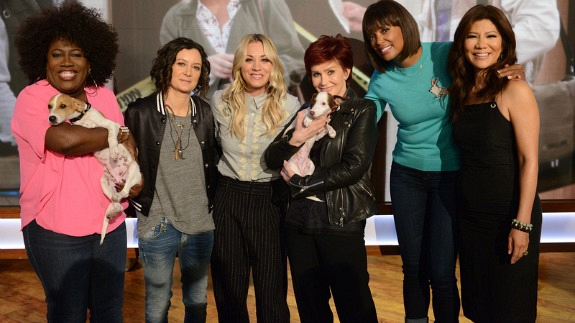 Actress and animal rights activist Kaley Cuoco stopped by The Talk on Thursday to chat with the hosts about the exciting 10th season of The Big Bang Theory, finding love, and her rescue shelter, Paw Works. For a decade, Kaley has captivated the hearts of millions as Penny on CBS' hit comedy, The Big Bang Theory—and she has no intention of stopping soon. As the Season 10 premiere approaches, Kaley said she and the cast would love nothing more than to continue working together. "We're so in love with each other, and we still have so much fun, that I can safely say we want to be here as long as possible—we're nowhere near done," she said. Kaley's character has undergone some changes since the series started in 2007, from hairstyle evolutions to tying the knot with her best friend. But, the actress said there's one change that will have fans rolling. In the Season 10 premiere, viewers will finally meet Penny's mother, Susan (Katey Sagal), and brother, Randall (Jack McBrayer), as her family heads out West for her second wedding with Leonard. "We're a very funny family," she said. Before she said goodbye, Kaley brought out two very special guests to help her promote her latest endeavor, working with animal rescue shelter Paw Works. Awww, who could say no to those faces? Watch The Talk weekdays on CBS and CBS All Access. Plus, mark your calendars for the Season 10 premiere of The Big Bang Theory, which airs on Monday, Sept. 19 at 8/7c on CBS. Stream it live or on-demand with CBS All Access.